The Old Granary Burying Ground dates from 1660, and contains the graves of many famous people, including eight governors of the early days: John Endicott, Richard Bellingham, William Dummer, Samuel Adams, James Bowdoin, James Sullivan, and Increase Sumner. Also buried here are the Wendells, Lydes, and Checkleys; Peter Faneuil, Uriah Cotting, Samuel Sewall, John Hull, Nathaniel Byfield, James Otis, Thomas Cushing, Paul Revere, Dr. John Jeffries, Robert Treat Paine; the Reverend Doctors Eckley, Stillman, Lathrop, and Baldwin; the parents of Benjamin Franklin; and also the victims of the Boston Massacre. The grave of Elisha Brown, who barricaded his family in his house for 17 days as an act of defiance against the British, is located near the Franklin obelisk. 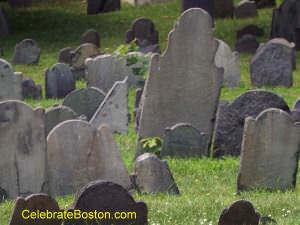 Another Patriot, Doctor David Townsend, is entombed here. His marker is located just inside the cemetery on the left side. Mary Goose, publicized falsely as the real Mother Goose, is buried at Granary. Benjamin Woodbridge, victim of a famous duel on Boston Common in 1728, is interred along the fence near Tremont Street. The territory was once a part of Boston Common; and the old town granary [grain storage building], which formerly stood where the Park Street Church now stands. It is protected by a substantial iron fence, with an imposing gateway in its center. 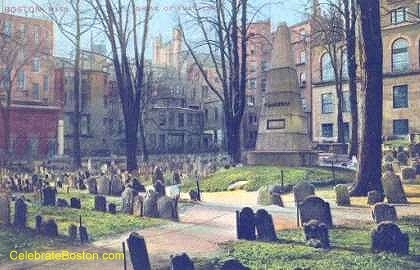 Inside the enclosure, are many fine trees; and they contribute much to the picturesque appearance of the old burying ground with its winding narrow paths, and its graves and somber tombs.